Master Core: ABIS is the only boss of Sonic Riders: Zero Gravity. 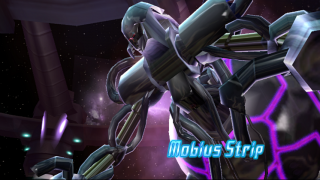 Appearing in the last level, Mobius Strip, ABIS is formed by SCR-HD's transformation within Astral Babylon, twisted under the influence of the "Lightless Black" and the Arks of the Cosmos into this enraged giant. Determined to stop him before all of Sonic's world gets sucked into the evolving singularity, the heroes fly their Extreme Gear into the swirling ruins of Babylon Garden to take down the robot. The Master Core rally is fought on a mobius-strip-shaped racecourse; Sonic pursues the retreating behemoth while ABIS hurls meteor storms and energy blasts into the track. The robot is also capable of initiating Gravity Drive, but Sonic can use this to boost forwards himself and smash into Master Core's rocky underside. Six hits sees the robot being drawn into the black hole itself, destroying SCR-HD once and for all, as well as stopping the Lightless Black. Original Soundtrack "Zero Gravity Tracks"
This page was last edited on 8 April 2018, at 08:48.